Happy Sunday all! After a first cup of coffee at home and watching the rain from the comfort of the couch, K and I decided to head out to breakfast at a neighborhood diner and a favorite of ours. Britton’s, in my opinion, has the best chile verde around and it makes for a killer omelet! It also has enough calories to be my only meal of the day! Lol! With appetites sated we stopped at the home improvement store on the way home so that I could cross one of the to-do’s from the ever growing list that all home owners acquire. The kitchen ceiling vent hadn’t worked since I bought the house 4 years ago. I rarely had thought of it since I had a fan vent in my over-the-range microwave, so the need rarely arose when I could have really used it. But while my dad was here to install my new gas range he happened to glance up and ask about it. My dad being him had the cover off less than a minute later to see what the problem might be, thinking that perhaps it had just been unplugged. Never having looked at how ceiling vents worked before I had no idea that they simply plugged in, otherwise I would have made this one of my first new home projects. As he suspected, it was unplugged, but more than that it was discovered that the old plastic fan blade had actually broken down and deteriorated to the point where it crumbled when you touched it. No wonder the old owners unplugged it! So today I bought a new motor and fan blade to replace it. Other than lots and lots of scrubbing to get the years of built up grease under control (not gone, just under control!) the actual mounting of the new unit took no time at all. The vent flaps don’t open and close as well as I’d like. They are still quite sticky and I’m not sure how better to clean them. But the wall switch, when pushed, now results in the quiet whirring of a ventilation fan! Go me! sewing project as it can get! And the results were amazing. That little bit of extra detail makes a big difference and is the perfect compliment to the existing decor. And no more lumps at the bottom ! I did also manage to get past the boring section of knit on the cardigan. And it sure isn’t boring now! The center back stitches have been removed to a stitch holder and will later be picked up again to form the medallion. It’s something I have quite a bit of trepidation about and I’m not sure how I’ll measure up to the task. But I certainly won’t know without giving it a try, right?! 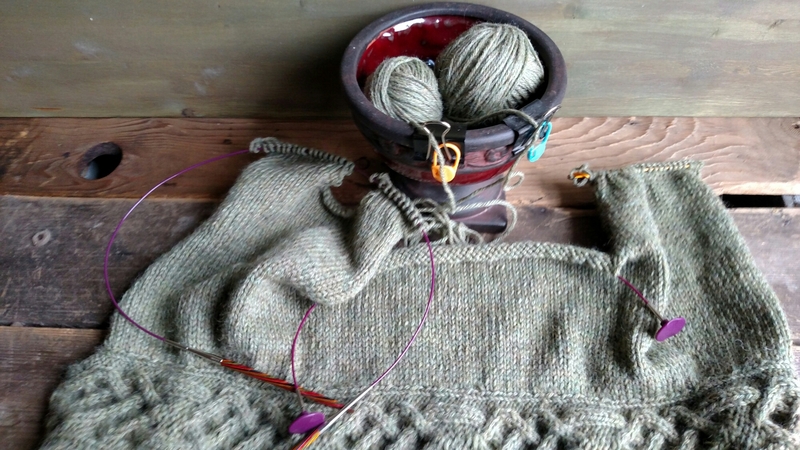 I’m currently forming the left front and back with armhole. *Bonus – I discovered my knew interchangeable needle cables make a great stitch holder for larger sections. And last, but not least, it seems I’m not the only one being productive! The hens are back at it again with 4-5 eggs a day currently. With 9 chickens I have yet to ever get 9 eggs in one day. Most chickens lay about every 26 hours so every few days they’ll skip a day. 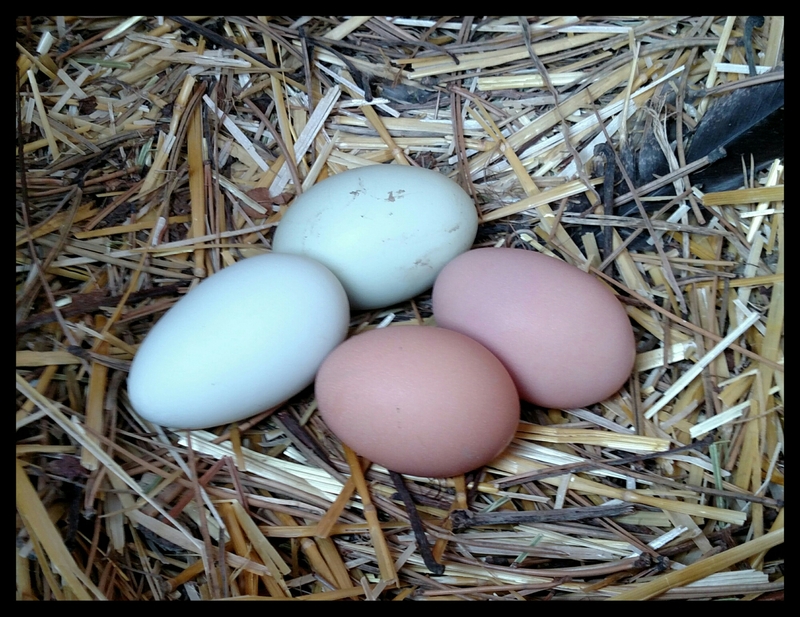 The picture does not do it justice, but the egg at 9 o’clock is a crisp ice blue and the egg at noon is a lovely mint green. Previous Post Dye Lots, Die!